When an invited user does his first Booking on the All Mistree App/Site, the inviting user gets ₹ 100 Cashback. Invited user means having one who has Registered Through referral link. This booking must be the first ever booking of the user on All Mistree. Offer is valid for only bookings using to other All Mistree users, or if a booking is done with All Mistree app/site. The invited users will get the cashback for first booking only once. The Cashbacks will be credited to the All Mistree Wallet within 24 hrs. A successful referral is when an invited user successfully completes a booking as per the above conditions. Weekly winner with the highest number of successful referrals will win ₹ 2,000, the first runner up will win ₹ 1,000 and the second runner up will win ₹ 1000. Weekly winners will be picked based on number of successful referrals in the week, with the week starting from Monday and going on till Sunday - the first week will be from 8th Jan 2018 to 17th Jan 2018 and the weekly prize money will be prorated for this duration. Winners will be announced on the next day by 6 pm. 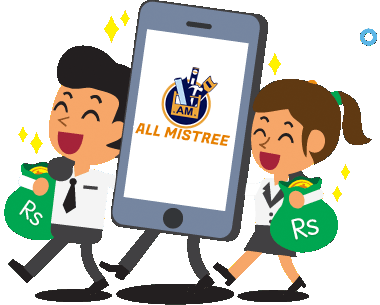 All Mistree has the right to amend the terms & conditions, end the offer, or call back any or all of its offers without prior notice. In case of dispute, All Mistree reserves the right of final decision on the interpretation of these Terms & Conditions.